BRIDGETOWN – CARICOM has reportedly narrowed down the options it intends to pursue to prevent a break in market access in the United Kingdom due to the UK’s planned exit from the European Union (EU). 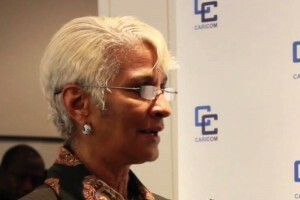 Director General of the Office of Trade Negotiations at the CARICOM Secretariat, Ambassador Gail Mathurin said while a number of possibilities were being considered, one option appears more probable. “It is highly likely that we could see the process going forward in two stages. One, we legally seek the new agreement with rollover provisions to ensure no hiatus; and secondly, we seek a commitment with the UK that at an agreed time we would sit down and re-examine the agreement with a view to negotiating better terms,” she said. Ambassador Mathurin was addressing a two-day private/public sector forum that zeroed in on the so-called Brexit and its implications for Barbados and the region. She said any option pursued by CARIFORUM states that had signed the Economic Partnership Agreement with the EU and which would be affected by the UK’s decision, must be in line with World Trade Organization (WTO) rules. She explained that this would prevent other WTO members from challenging trade between CARIFORUM and the UK. CARICOM exports to the UK represent around 21 per cent of what is sent to the EU. While the UK is prevented from holding official bilateral talks on the matter, the ambassador said informal discussions have taken place. One day earlier, at the same forum, a senior Barbados government official strongly criticized CARICOM for being “weak” in taking advantage of the EPA signed between CARIFORUM and the EU in 2008. “A lot of the challenge that we face in rolling forward and really making things happen can really be placed at the feet of our regional institution tasked with really keeping the momentum going,” Minister of Industry, International Business and Small Business Development Donville Inniss said.